Defend your right to haul it all up on your roof―and look great doing it―with the Smittybilt Defender Roof Rack. Designed for maximum off-road functionality and style, your Smittybilt roof rack keeps your cabin clutter-free by holding all your gear on the roof. And cutting edge aerodynamic style blends with the rugged look of your rig. 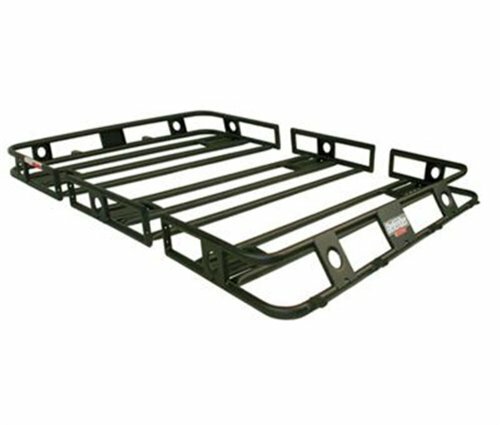 The Smittybilt defender rack is more than just a place to stow your stuff. It's designed modularly, with a fully integrated array of accessories that bolt on with ease. It includes 4 forward and 2 rear welded light tabs for mounting your off-road candlepower. And, the optional light cage bolts directly to the rack, protects your lights (sold separately) and complements the off-road style. If you have any questions about this product by Smittybilt, contact us by completing and submitting the form below. If you are looking for a specif part number, please include it with your message.